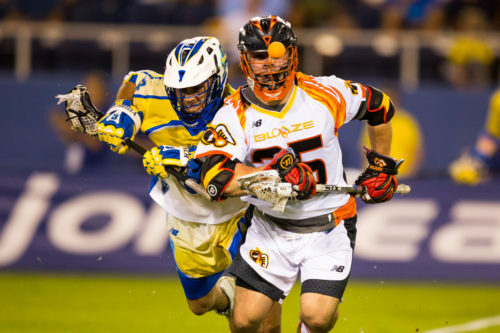 I am very close to completely jumping on the Atlanta Blaze bandwagon. It is hard to figure out how an expansion team will do in their first year, but so far, the Blaze look to be fighting for a playoff spot. Now that some of the pieces are coming together, you can see that this is not your ordinary first-year franchise. Also, when you realize Myles Jones, the #1 overall draft pick out of Duke will make his debut June 4 vs. the Boston Cannons, the Blaze are going to be even better. Led by two-time Major League Lacrosse Coach of the Year, John Tucker, this group is starting to click. Offensively, they are heavy with Syracuse alums who already have years of experience playing together. Kevin Rice, Randy Staats, Henry Schoonmaker, and Nicky Galasso honed their skills together in the Carrier Dome and the comfort ability has translated to the Blaze. The midfield also features some solid veterans, but the lack of midfield depth could hurt them as the season goes on. The Blaze added Scott Ratliff, last year’s runner-up for Defensive Player of the Year, to anchor the defense as he is 4th in ground balls and leads all defenders with nine points. Long stick middie Graeme Hossack, originally drafted by the Rochester Rattlers and came over in the trade that also brought Kevin Rice to Atlanta, has been outstanding in his first two career games. Adding big, young defenders, Casey Ikeda, who had a solid rookie campaign in Florida last season, and Chris Hipps, who played lacrosse at Duke and football at SMU, the Blaze defense has a great nucleus. Adam Ghitleman has played well in cage so far after spending last season with Tucker in Boston. The Blaze still have Dillon Ward on the shelf too. Ward led Team Canada to the Gold Medal in the World Championships two years ago, but has yet to find consistent success in the MLL so it will be interesting to watch how the goaltending situation unfolds. As the Blaze continue to play together more, this squad can be scary good by season’s end. Joe Walters, Chesapeake. Walters was the playmaker and finisher with four goals and three assists to lead the Bayhawks to a lopsided win over Denver. Scott Rodgers, Ohio. Rodgers is playing at an elite level as he turned away 17 of the Cannons 23 shots. Jackson Place, Ohio. Place held the league’s leading scorer, Will Manny, without a goal and only allowed Manny three shots on cage. Pannell brothers, New York. The veteran, Rob, had a game-high eight goals while his little brother, James, made his MLL debut with his first career goal. Graeme Hossack, Atlanta. In his second career game, Hossack had six ground balls, caused multiple turnovers and held Florida’s Lyle Thompson to a single goal. 1- Ohio (4-1) Currently have the league’s best offense and defense. 2- Charlotte (3-1) First time this season the Hounds defense played poor. 3- Chesapeake (3-1) Veteran team needs some help at the Faceoff X. 4- New York (3-1) Last year’s champ starting to hit their stride. 5- Atlanta (2-2) Back to back week’s putting up 22+ goals. 6- Boston (3-2) Offense disappeared vs. Ohio. 7- Denver (1-3) Defense looks very slow. 8- Rochester (0-3) Having Mike “Sharknado” Manley back should help turn things around. 9- Florida (0-5) Very little ball movement offensively. Brendan McDaniels is a color analyst for the MLL Television broadcasts and will be on Lax Sports NetworkSaturday, May 28 at 6 p.m. as the Rattlers host the Bayhawks. Follow Brendan on Twitter @McDanielsSports.